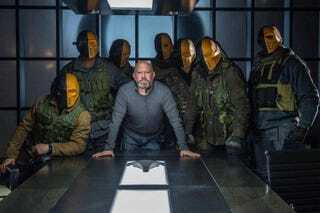 You probably best know Marc Guggenheim as the creator of Arrow, but he was a comic writer and fan long before Stephen Amell ever grabbed a bow. Now he’s returning to comic book stores with The Infinite Adventures of Jonas Quantum, and we got the details — including what’s in store for DC’s TV universe this fall. io9: Who is Jonas Quantum? What’s the comic all about? Guggenheim: Well, I’ll tell ya, it’s really designed to be both the introduction of a fun new character kind of in the vein of a James Bond or Indiana Jones but it’s also like a love letter to the medium of comics. Each issue’s going to be self-contained. It’ll be a story with a beginning, middle and end, and one reason I wanted to do that is you’ve got this character who by virtue of his intellect can invent anything and that includes a spaceship, includes a time travel machine, includes a dimensional portal… so the sky’s not even the limit anymore with this idea. I wanted to recapture the way I felt reading the original issues of Fantastic Four and books like it where you never knew what was coming next and each idea seemed crazier and more out there than the next. When you think about all the number of worlds and characters and concepts that the first hundred issues of Fantastic Four introduced, I just wanted to recapture that feeling that I had as a reader. And I’m sort of inspired by the likes of Grant Morrison and Warren Ellis, guys who I always sort of — in a complimentary way — described as completely reckless with ideas. They will waste an idea that could be a multi-million dollar, big budget film on a single panel, and I love that. I love reading it and I want to see if I can write it. Is Jonas Quantum more of a pulpy adventurer like Doc Savage, or like a Fantastic Four/Reed Richards kind of genius? Guggenheim: Doc Savage, Indiana Jones, Flash Gordon… these were the kinds of characters I was thinking about as I was developing Jonas Quantum because there aren’t that many brand new characters being introduced anymore. Everyone seems to be a reinvention of old characters and I wanted to try to add a new character to the pop culture canon. Which I know sounds really obnoxious and almost too ambitious but I’ve been so fortunate to be able to adapt other people’s characters, I wanted to give back a little bit and try creating my own character. So it’s set in the present? Guggenheim: Yeah, the setting is modern time. The fun of it is that while it’s modern times, the presence of this guy in the world has basically brought the future to us sooner than we expected. Imagine if Steve Jobs or Thomas Edison or Albert Einstein were all alive 10, 20, 30 years before we know them to be alive, it would have advanced the world that much sooner. And that’s one of the big ideas behind the book. In the comic’s description it says that Jonas “does not play well with others.” What do you mean by that? Guggenheim: Basically… his power is his intellect, but his Kryptonite is also his intellect. Because literally from birth he has been so much further ahead than everyone else that it’s just been very difficult for him to interact with other human beings. This is a guy who lives so much in his head that it’s very hard for him to get out of his head and be emotional. You can’t just relate to people on an intellectual basis especially when you’re thinking twenty moves ahead of them. So that’s his challenge— how can he be so smart and still relate to ordinary human beings. Kind of like when Reed Richards gets so caught up in his work he completely ignores his wife and child? Guggenheim: Poor Reed. Actually, I think Reed’s much better adjusted. I don’t think Jonas is a misanthrope but I think Reed is much better adjusted than Jonas is. Reed may occasionally ensconce himself in his lab and forget that he’s got a wife and kid but he does a wife and he does have a relationship with Johnny and he does have a relationship with Ben so he’s at least capable of human interaction on a much more high functioning way than I think Jonas is who literally will go out on a date and literally not be able to figure out what to say to a woman not because he’s so nervous but because his mind is literally going at a hundred miles an hour. To slow down to what for him is walking speed really feels like an impossibility. Since you’re in charge of Arrow, writing a comic book TV show is you day job. Why are you writing a regular comic book in addition to that? Are you not sick of telling comic book stories? Guggenheim: I know. You’d think I would be. In terms of time and the amount of money I can be paid in Hollywood, it’s not a great return on investment. At the end of the day, I love the medium of comics. Obviously, I love superheroes, I love comic book characters but I…I guess I’ve had a lifelong affection for comics and while I love the characters so much, I also love the medium. I love telling stories in the comic book form. And so while Arrow certainly scratches my itch for writing superheroes, it doesn’t scratch that itch for telling a superhero comic book even though I do the Arrow 2.5 comic on the side. My wife is asking these questions too: “You’re doing all this stuff with Arrow, the comics, the show…why’re you writing this other stuff? Spend more time with the kids.” And she’s right and you’re right and I think I can only say that clearly I have a problem. So onto TV. Since the Arrow finale just aired this week, what can you tell us about next season? Guggenheim: Ah, good question. It will take a lighter tone. That’s pretty much the only thing I say without spoiling it. We’ve been working for about a month now in the writers’ room, talking about season 4, and I think that one thing we all collectively understood was season 3 beginning with Sara’s death, because it’s the death of a major character on the show, it set a tone for the remainder of the season. And I’m not the least bit apologetic for that tone. I happen to like dark and I like the fact that Arrow is a pretty dark show particularly for a network show. That said, every year you want to mix things up and there was sort of a collective desire on all of our parts to try to inject a little bit more lightness into the show, a little bit more humor. It’s not going to radically change. The show’s still going to be the show but in terms of tone we’re coming off a very very hard season for all of our characters. We wanted to try to mix it up a little bit. Can you comment on the fact that Arrow season 3 has followed the same basic story of Batman Begins? Guggenheim It’s funny. Certainly a lot of people have found parallels to both Batman Begins and also to Ra’s al Ghul and the comics as he’s been portrayed. I think to a certain extent it comes with the territory of telling a story with the League of Assassins and Nanda Parbat and Ra’s al Ghul. One thing I often say, for us the difference between Batman and Arrow, the difference between our version of Oliver Queen and Bruce Wayne is that Bruce Wayne tends to make the right decisions. You can’t really point to too many instances where Bruce Wayne’s been on the wrong side of a judgment call whereas I think Oliver makes a lot of bad choices. Oftentimes I joke in the writers’ room that Oliver’s bad choices are part of the currency of the show. Well, Oliver has grown as a character a lot more than Bruce Wayne did in the Dark Knight trilogy. Guggenheim: I think so too and one thing we’ve always said is that the whole show is really Batman Begins. There’s a reason why the show is called Arrow and not Green Arrow. And he is in constant evolution and part of being in constant evolution and needing to grow both as a hero and as a human being is the fact that he doesn’t always make the right choices. Or at the very least he makes choices that feel right to him but don’t feel right to other people. And I think that’s something we definitely see in play in the final episode of season 3 whereas Bruce Wayne, y’know, he usually gets it right. To me that’s the key difference. Okay, if Arrow is the dark superhero show, and The Flash is the lighter, more comic book-ish show, what will that make Legends of Tomorrow? It can’t just be the team show, because both Arrow and The Flash have pretty big teams themselves at this point, right? Guggenheim: It’s definitely not just the team show. I think the show is going to be bigger, louder, more ambitious even than Flash and Arrow. I think Flash raised the bar on Arrow in terms of adding superheroes and we’re looking to now have the show raise the bar on Flash so you feel like the shows are getting bigger and bigger. One thing we sort of always tell you is that with Flash we’re really trying to provide a feature film every week. With this show we’re trying to provide a summer blockbuster every week. DC is doing a pretty fantastic job with its TV shows. What do you think makes DC superheroes seemingly so much better suited to TV than Marvel’s heroes? Well, I don’t want to get you in trouble at home. Guggenheim: Honestly, I absolutely love Daredevil and I think… y’know, I mean, um… it’s funny, it’s a little bit like… it’s hard for me to answer that question without accepting the premise and if I were to accept the premise, it would get me into a fair amount of marital trouble. Let me put it this way: If someone had told me five years ago that there would be a TV show starring the Atom, I would have laughed in their face. Ho do you make putting DC heroes on TV look so easy? Guggenheim: Thank you. I appreciate that. Yeah, that’s much better. Honestly, we’ve been very lucky that we’ve put together, starting with Arrow, a machinery and a way of working that really works for us and does allow us to do things a bit faster and still maintain a high level of quality. I would never say that we have it down to a science but each of those things is really really hard to pull off and they defy any attempt at making it easier. That said, we feel like we got a really good group of people to rely upon. There’s a lot of cross-pollination among all three shows now, with Legends, in terms of our casting people and post-production and overlapping writers. It’s just helpful. We have a really successful team. I think that, fundamentally, more than anything makes a difference. The Infinite Adventures of Jonas Quantum, written by Marc Guggenheim with artwork from DC Comics’ veteran Freddie Williams II, will premiere this September from Legendary Comics.